I went out to the Souhegan for a few hours today. My first stop was my usual go to spot in Milford. The water was a little high and slightly discolored but very fishable. I started off nymphing, slowly working my way upstream and covering every likely looking seam. Once I got to the bridge, I hooked into a nice mystery trout which ran me downstream and popped off. I continued working the same seam and hooked into a nice brookie. As I was about to land it, the top section of my rod bumped the bridge and unhooked the fish. Needless to say, I wasn't pleased since that bridge (you'll know it when you see it) has caused me grief in the past but all in all, I wasn't all that upset considering I hooked two fish in a short period of time. In interest of time, I switched up to a streamer to cover more water but didn't hook anything else. Most likely, the commotion of the first two fish may have put down the fish if me casting the water into a froth didn't ;). My next stop was the Monadnock Water Area. I had always passed this area but never fished it although I'd heard very good things about it. Today, I decided to stop by and give it a try. The water in this stretch is mainly composed of deep riffles (2-3 ft deep) and is fairly uniform in most areas. From afar, it looks great for nymphing but is better suited to chucking streamers or swinging wet flies. Unfortunately, I didn't get the memo until I got to the bridge. I switched back to chucking streamers and immediately had a follow! It followed the streamer back to the shore, saw me, and spooked away. Discouraging but not completely hopeless, at least I knew that there were fish here. I immediately made my way to the head of the pool and started quartering downstream and letting the fly swing into the calm seam. It wasn't long before I felt the familiar tug halfway through the swing and soon brought a nice bow to hand. I'm really getting the hang of setting the hook on the swing. Resist all urge to strip set and pull back slowly and deliberately instead of ripping it back. Soon after, I got another hit slowly stripping it back but it missed the business end of the hook. I started to walk downstream slowly and got another bow on the swing. It was much smaller (6-8 in.) than the last one but you wouldn't guess with the fight it put up. All in the while, I was eyeing some nice nymphing water upstream so after not registering any further bites, I moved that way. I wasn't expecting much since fish tend to spread downstream but I was pleasantly surprised to hook a nice brown on guess what?....a bead head soft hackle! I continued fishing further up and missed a couple hits in the next couple pockets immediately upstream. By this point, more fly fishermen had arrived at the bridge so I decided to continue even further upstream. After skipping over some more riffle water, I found some more nice pocket water. After a few casts, I hooked into yet another brown! Feeling great, I continued further upstream in hopes of hooking into a holdover or a native brookie. 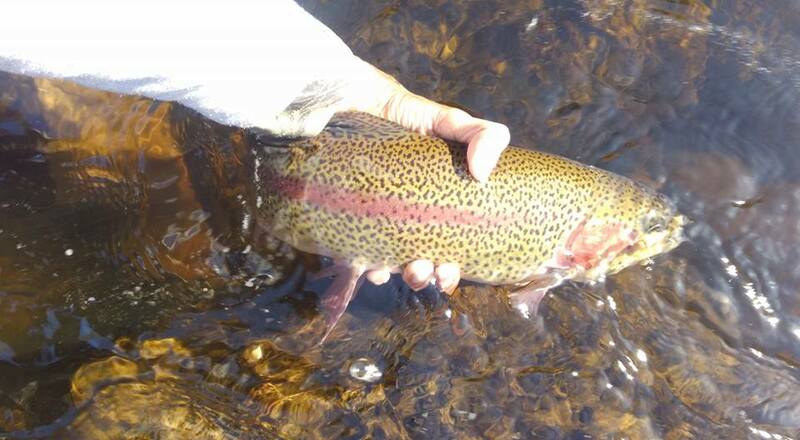 Unfortunately, my mojo ended there as I didn't hook anything else but I guess this is par for the course if you fish the Souhegan river; you cover a lot of good looking water but only some of it holds fish. I took a few photos on the way out. All said and done, it was a great day! I hit my first triple play (rainbow, brook, and brown) and I successfully scouted some new water. The Souhegan is slowly becoming one of my favorite southern New Hampshire streams.